we think a brief history of the True Cross may be of interest to our Parishioners and viewers. 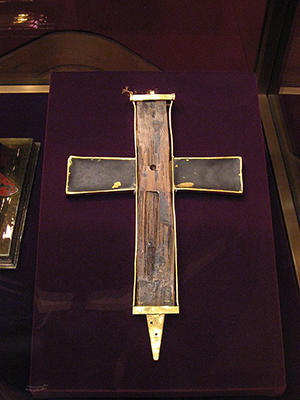 ‘A fragment of True Cross in the Schatzkammer (Vienna). The True Cross is the name for physical remnants which, by a Christian tradition, are believed to be from the cross upon which Jesus was crucified. According to post-Nicene historians such as Socrates Scholasticus, the Empress Helena, mother of Constantine, the first Christian Emperor of Rome, travelled to the Holy Land in 326–28, founding churches and establishing relief agencies for the poor. Historians Gelasius of Caesarea and Rufinus claimed that she discovered the hiding place of three crosses that were believed to be used at the crucifixion of Jesusand of two thieves, St. Dismas and Gestas, executed with him, and that a miracle revealed which of the three was the True Cross. 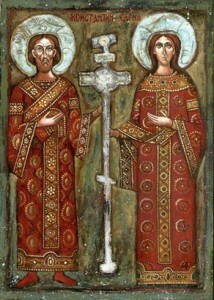 Sacred icon depicting the Emperor Constantine with his mother St. Helen, who is reputed to have brought the True Cross from the Holy Land. Many churches possess fragmentary remains that are by tradition alleged to be those of the True Cross. Their authenticity is not accepted universally by those of the Christian faith and the accuracy of the reports surrounding the discovery of the True Cross is questioned by some Christians. The acceptance and belief of that part of the tradition that pertains to the Early Christian Church is generally restricted to the Catholic and Orthodox Churches. The medieval legends that developed concerning its provenance differ between Catholic and Orthodox tradition. These churches honour Helena as a saint, as does also the Anglican Communion.